Titled “Brain and Salivary Gland Tumors and Mobile Phone Use: Evaluating the Evidence from Various Epidemiological Study Designs,” the new paper is a detailed look at the literature and includes a meta-analysis of many of the studies that have been completed over the years. The lead author is Martin Röösli of the University of Basel in Switzerland. The paper is slated to appear in the 2019 edition of the Annual Review of Public Health, which is scheduled to be published in the spring. The paper was posted online on January 11. Röösli has four coauthors: Maria Feychting of Sweden’s Karolinska Institute; Joachim Schüz, a senior manager at IARC in Lyon, France; Italy’s Susanna Lagorio; and the U.K.’s Minouk Schoemaker. Both Röösli and Feychting are members of ICNIRP; Feychting is its vice chair. Four of the five, all except Röösli, worked on IARC’s Interphone project, a 13-country study of cell phones and cancer. They were part of the faction that maintained the results do not show a link. In 2011, a panel assembled by IARC —Röösli was a member— disagreed and used Interphone as part of its rationale for classifying RF radiation as a possible human carcinogen (2B). At the close of the panel meeting, there was talk of a minority report by those who disagreed with the 2B designation. But it never happened. The Annual Review paper fills that gap, though it’s a bit late as many are now asking IARC to reclassify RF radiation as a probable human carcinogen (2A), or even as a known carcinogen (1) in light of the NTP and Ramazzini animal studies. In December, Australia’s Rodney Croft, another member of ICNIRP, published an analysis that had the same general objective. It is less sophisticated than the new review, and many say that it is flawed. Michael Jerrett of UCLA, a member of the Annual Review’s editorial board, solicited the review paper. His expertise is on exposure assessment and his recent research has addressed air pollution as well as behavior and obesity. Moskowitz, an epidemiologist who tracks RF and health developments on his Web site, Electromagnetic Radiation Safety, has long believed that there is sufficient evidence to adopt precautionary policies and to limit exposures. Ten years ago, he was a coauthor of a meta-analysis that found “possible evidence” linking mobile phones to cancer. Jerrett asked for another external review of the manuscript and later sent all the comments to Röösli with a request for revisions. Moskowitz says that he was never sent the revised manuscript for a second review. Jongsma told me that neither of the outside reviewers was asked to take another look and that the decision to publish was made by the Editorial Committee on its own. Asked whether members of the Committee have had experience with the RF issue, Jongsma answered yes, without offering any specifics. There are 120 publications cited in the review paper. In a “note” published today, the 12-member group states that the studies by the National Toxicology Program (NTP) and the Ramazzini Institute “do not provide a consistent, reliable and generalizable body of evidence.” “Both studies have inconsistencies and limitations that affect the usefulness of their results for setting exposure guidelines,” according to ICNIRP. In contrast, a peer review panel of toxicologists and pathologists recently found that the NTP study showed “clear evidence” of RF carcinogenicity. The current ICNIRP limits were set 20 years ago and are based only on acute effects. Two months ago, ICNIRP issued revised draft guidelines for public comment which are largely unchanged and also discount cancer risks. On the other hand, Jim Lin, the editor-in-chief of Bioelectromagnetics and a 12-year former member of ICNIRP, recently wrote that, “Perhaps the time has come to judiciously reassess, revise and update [the ICNIRP] guidelines” so that they protect against long-term RF exposures. For more on the NTP study: go here. And for more on the Ramazzini study, go here and here. His obituary is posted on the Web site of the EMF Safety Alliance. 3. NTP will continue to do RF health studies. A new exposure facility is being built on the NIEHS campus, which will be smaller and more flexible than the one used for the two-year exposures of the rats and mice in Chicago. It should be ready by late summer. The NTP press release, “High Exposure to Radiofrequency Radiation Linked to Tumor Activity in Male Rats,” is here. Even before the NTP released the two reports this afternoon, it posted an updated version of the “partial” report it issued on the rats in May 2016. The new report features a few tweaks and the addition of a new Appendix (B2), which responds to the criticism of NIH's Michael Lauer that have been frequently cited to counter concerns of a cell phone cancer risk. After the release, Jeffrey Shuren, the director of the FDA’s Center for Devices and Radiological Health called the NTP evidence of a cancer risk “mostly equivocal or ambiguous.” The bottom line, he said, is that, “We believe the current safety limits for cell phones are acceptable for protecting the public health.” The FDA requested the NTP study back in 1999. The NTP draft rat cell phone report runs 381 pages and the draft mouse report is 270 pages. They can both be downloaded here, where other related papers and data are also available. The NTP will hold a public peer review of the reports on March 26-28 in Research Triangle Park, NC. An audio file of the press conference together with a transcript will be posted on the NTP Web site early next week, according to the NTP press office. For more of Microwave News’ coverage of the NTP RF project, go here. The National Toxicology Program (NTP) has announced that the draft reports on its $25 million animal study on the cancer risks associated with cell phone radiation will be released on February 2. A peer review meeting is scheduled for March 26-28 in Research Triangle Park, NC. Further details are available here. The Federal Register notice is here. Preliminary results pointing to a cancer risk were published close to two years ago. See the Microwave News story that prompted the release here. For more of our detailed coverage, check out these links. The highest SAR on the wrist is 0.34 W/Kg for the A1861 (0.18 for the A1860). 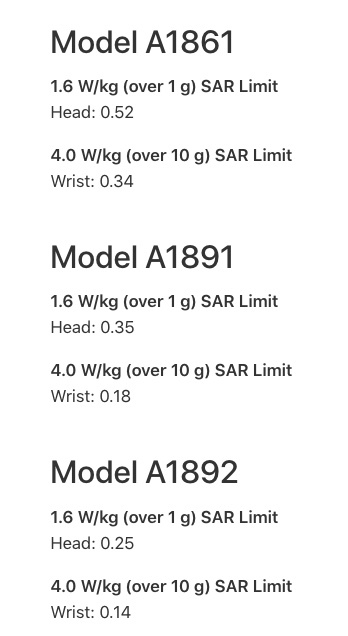 These SARs are measured without any separation from the wrist. 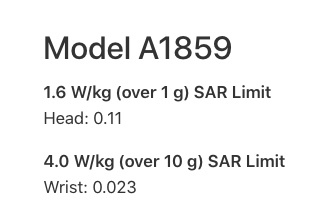 Note that the SARs measured for the wrist are averaged over 10g of tissue. 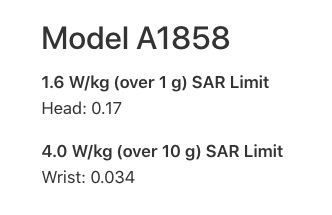 The basic FCC SAR limit is pegged at 1.6 WKg averaged over 1g of tissue. Many European countries follow the ICNIRP guideline of 2.0 W/Kg averaged over 10g. Averaging over the smaller volume (1g instead of 10g) can double or triple the maximum SAR (see MWN, J/A00, p.8, S/O01, p.10, and M/J03, p.4). Here are the preamble and the SAR numbers that Apple posted on its Web site earlier today. 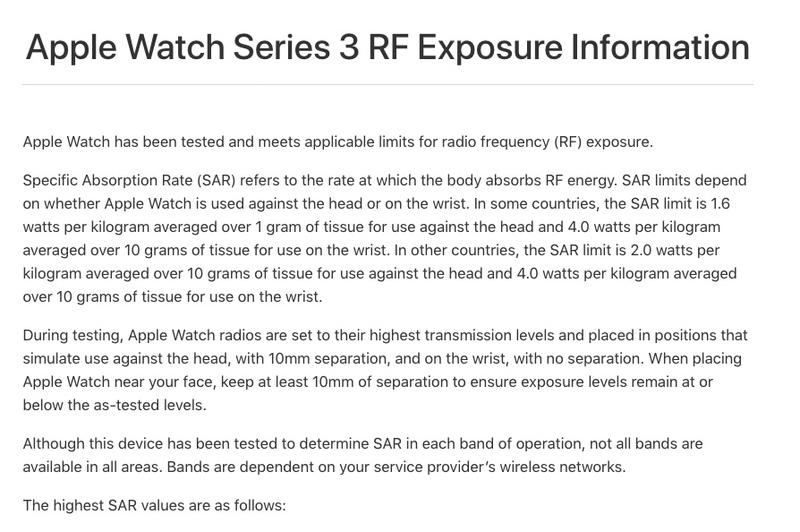 Apple has posted the SARs for its watches, phones and other products here. “The complete results from all the rats and mice studies will be available for peer review and public comment by early 2018,” the NTP states. The animals were exposed to GSM or CDMA radiation for two years before they were sacrificed and evaluated for signs of cancer. The NTP report had been expected by the end of this year. The final report has been highly anticipated since the spring of last year when the NTP announced that cell phone radiation increased the incidence of tumors in the brain and heart of male rats. At the time, the NTP posted some partial results from the rat experiments. No details of the mice studies have yet been made public. The early release followed a story on the findings in Microwave News. The cell phone manufacturers —Apple, Google, Nokia (Microsoft) and Samsung— have all remained largely silent. In addition to the animal studies, the NTP will release its findings showing DNA breaks in the brains of the male rats. The original plan was to publish those results as a stand-alone paper, but they will now be part of the general report. De Vocht states that the correction had “no significant impact” on his conclusions. Yet, the two plots in the correction look very different from those with the same titles in the original paper. We asked de Vocht to comment on the significance of the side-by-side plots. He demurred. “I don’t know enough about how mixes of different types of brain cancer subtypes/gliomas behave over time,” he told us. de Vocht encouraged us to talk to Alasdair Philips, the founder of Powerwatch who has been studying brain tumor rates in the U.K. and is preparing his own analysis for publication. Indeed, it was Philips who first spotted the error in de Vocht’s paper, which led to the correction. While the new plots in themselves say nothing about any possible links between cell phones and brain tumors, they go a long way toward puncturing the argument offered by numerous public health officials and media outlets that such an association is highly unlikely because the overall incidence of brain tumors has remained relatively stable over the last number of years. GBM has been rising in the U.S. as well as in other countries. The answer is in the NTP report. The tables on pp.9-11 show a clear difference between male and female rats with respect to the incidence of spontaneous tumors among the NTP historical controls. 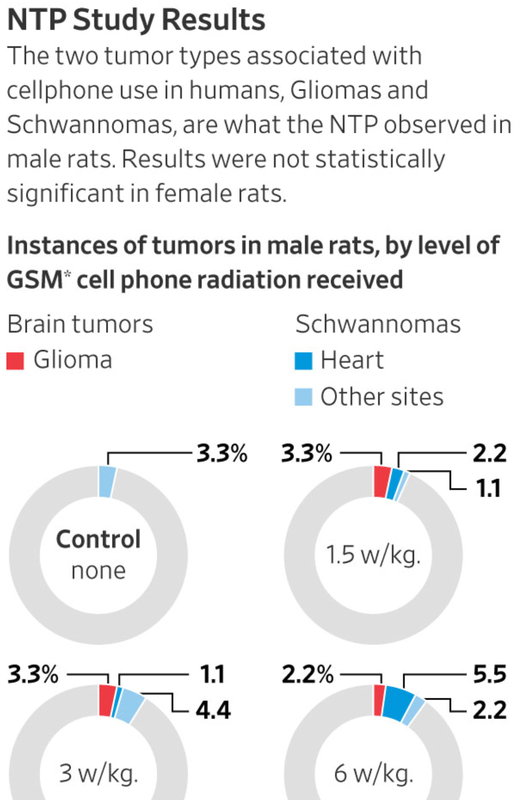 Male rats were more than ten times more likely to develop malignant gliomas (brain tumors) than females: 11 of 550 males developed glioma, compared to only 1 of 540 females. For malignant schwannoma of the heart, the difference is less pronounced, but still evident. Males were more than twice as likely to develop this type of cancer than the females: 9/699 vs 4/699. 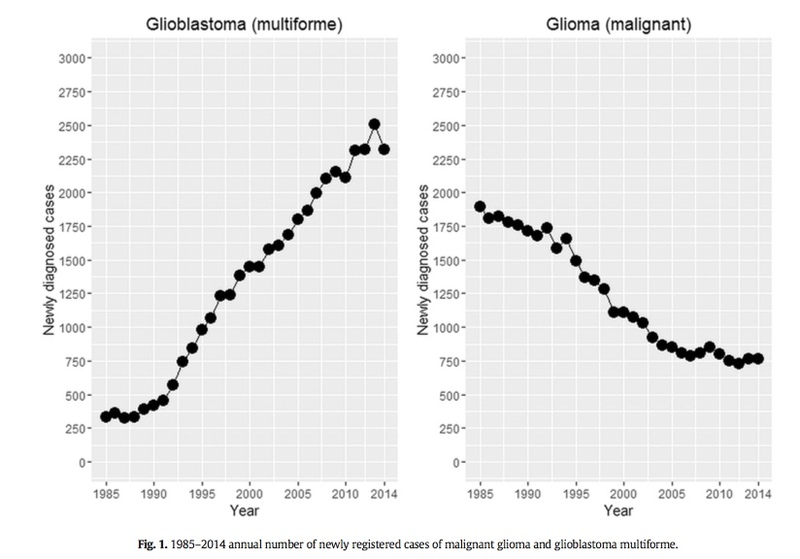 Note also that, while none of the control rats in the NTP cell phone study had glial or Schwann cell tumors (or pre-cancerous lesions, hyperplasias, in these two cell types), some exposed females did develop them but the increases did not reach statistical significance. And: “Gender Differences in Chemical Carcinognesis in National Toxicology Program 2-Year Bioassays,” published in Toxicologic Pathology in 2012. The paper is open access.